The exhibit will run throughout the month of February at the Yesteryear Village at the South Florida Fair. The work of 26 African American painters better known as the Highwaymen now have a temporary home at the South Florida Fair. For Steve Carr telling stories comes easy. His favorite is that of 25 men and one woman. For Carr these are people who shaped modern landscape art. "They preserved old Florida in it's natural beauty by painting it," he said. Now he's preserving their history. 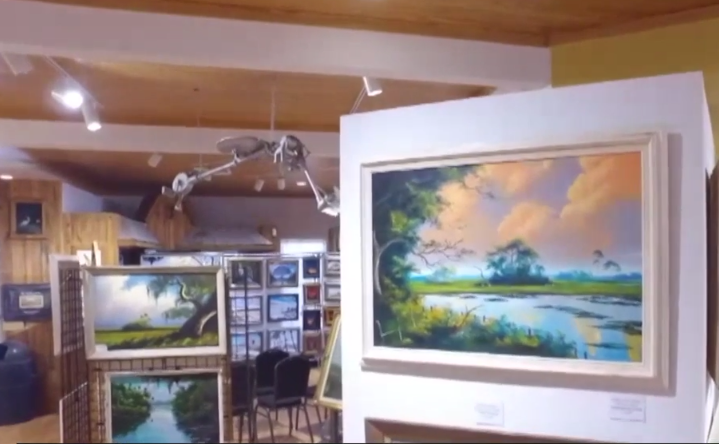 By opening an exhibit at Yesteryear Village featuring original works of art by those 26 people known as the Highwaymen. "In Jim Crow south you weren't black and an artist, yet they were," Carr said. Like Candie Carroll Ingram's mother. "And she will kill you if you call her famous she was so modest about everything." Ingram said. One of the original members of the Highwaymen Marie Ann Carroll would spend her days working in the field and nights painting her take on paradise. "A lot of people still say to this day 'I didn't know it was a woman.' And I said, 'Yeah my mom was the only woman.' Not just the only woman, she's the queen of the road," Ingram said. Caroll's journey as one of the Highwaymen led her to the White House where she was honored for her work. "But one thing about it when she put it on canvass or on board it's true authentic life is what it is," she said. The exhibit is open until Thursday through Sunday from noon to 9 p.m. and will run throughout the month of February at the Yesteryear Village at the South Florida Fair.